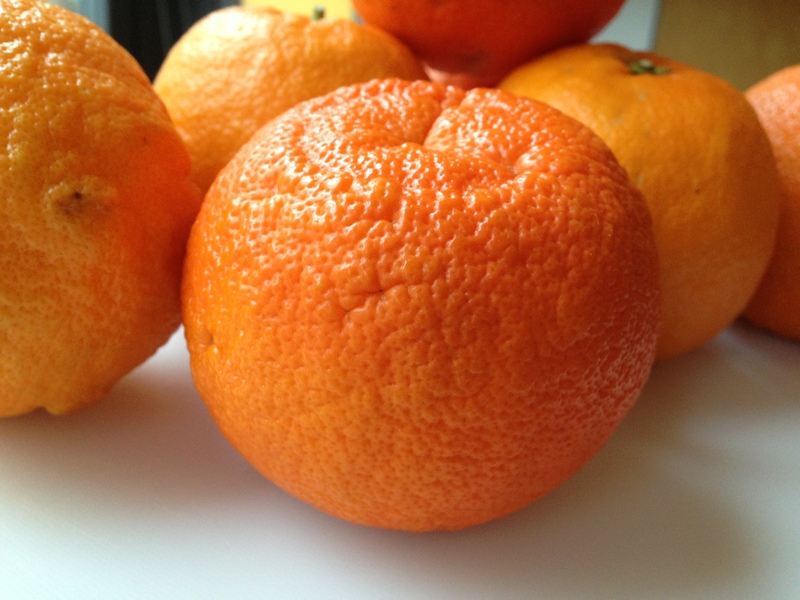 This recipe will work for any combination of orange or grapefruit. 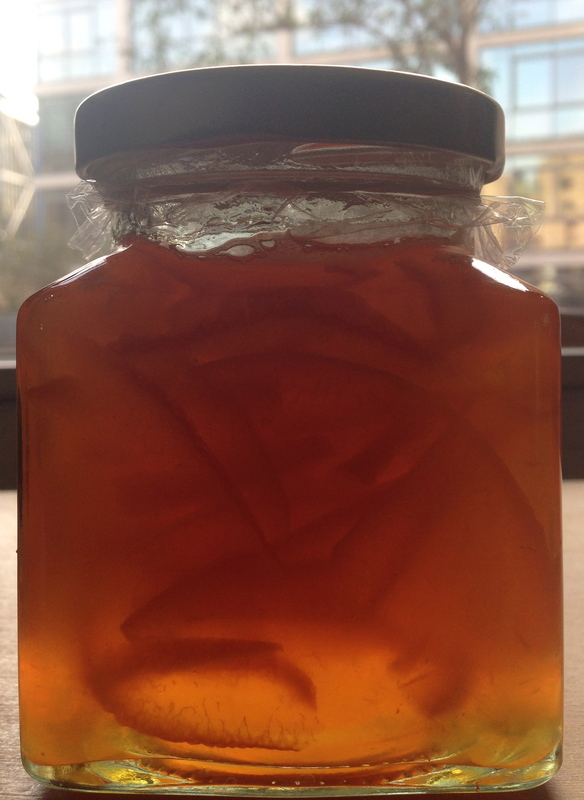 It contains some lemon juice, but note that lemon marmalade is a different beast altogether – the set is tricker – so I can’t guarantee these proportions and method will work with lemon. 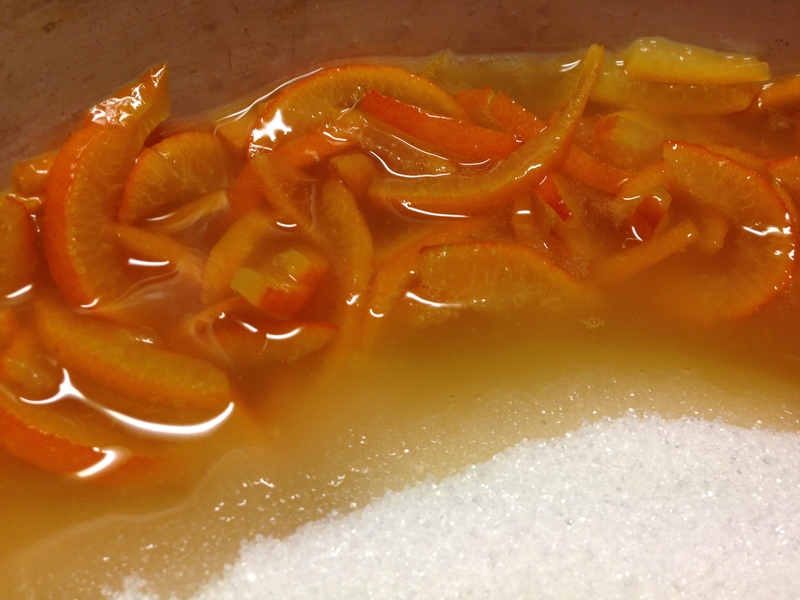 For a really bittersweet concoction, use Seville oranges. 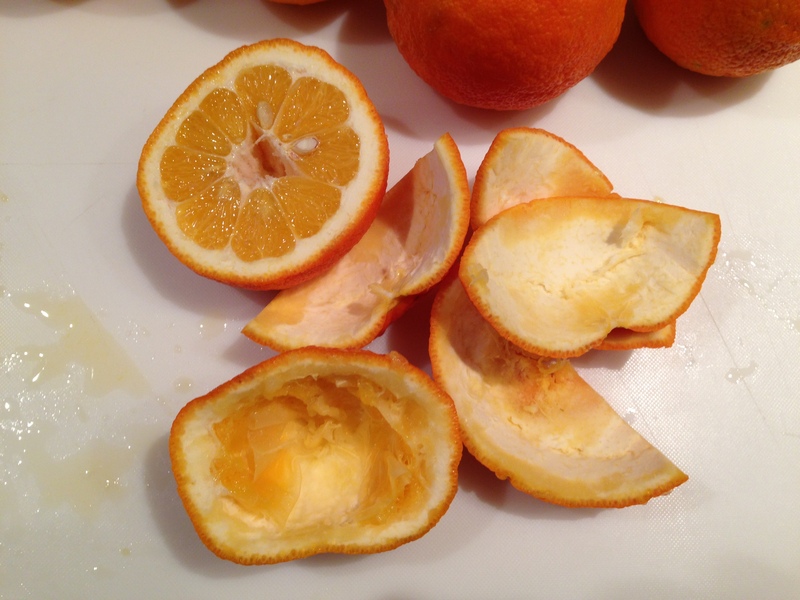 Their juice is bracingly sour and their peel is perfectly bitter, and they have lots of pips and pith to help your marmalade set. Grapefruit has some of the same sour-bitter qualities so if you can’t get Seville oranges you could substitute some grapefruit for part of the sweet orange weight. Line a basin with a piece of muslin, and squeeze the juice into it. 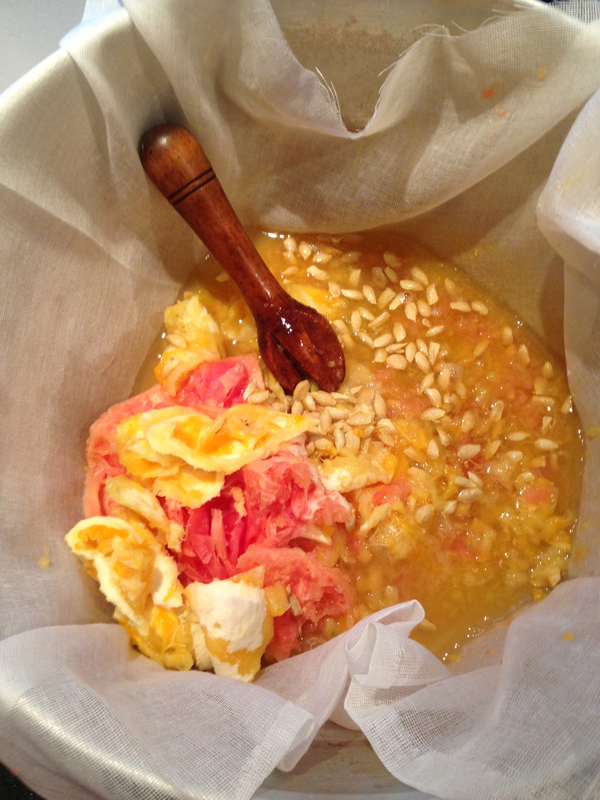 Scrape out the flesh, pips and a layer of the pith into the muslin-lined bowl. 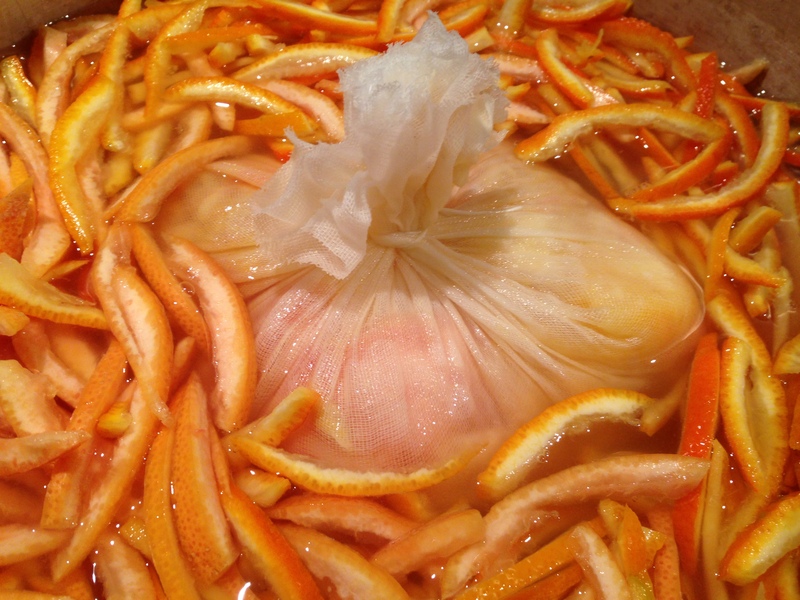 Pull the ends of the muslin together and tie together to make a neat bag containing the pith and pips. 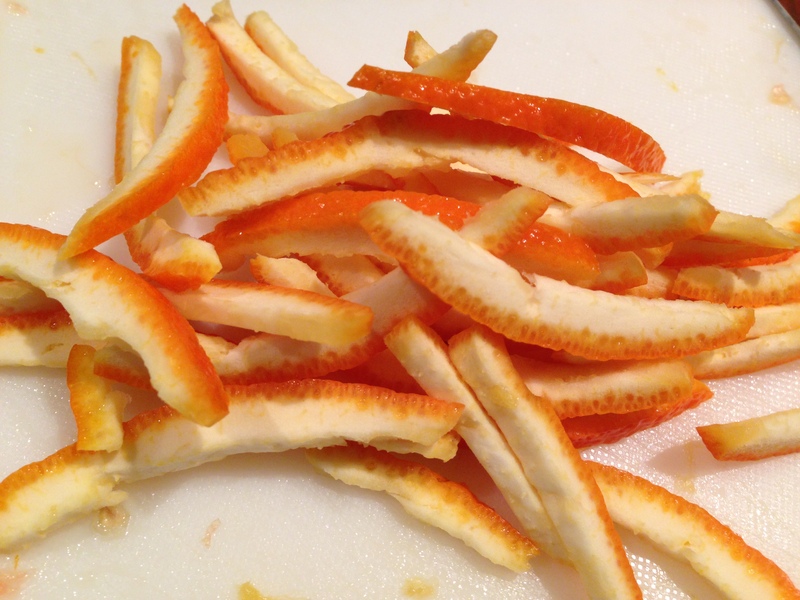 On a board, slice the pith-lined peel into thin strips to your liking – I aim for pieces about 2½cm – 3cm (1” – 1¼”) long and 2mm – 3mm (2/8”) wide. Put all of the sliced peel, along with the juice, the water and the muslin bag of pith and pips into a large preserving pan. Leave it to sit overnight. When you are ready to cook, bring the contents of the pan to a boil, reduce the heat and simmer for 1½ – 2 hours, until the peel has softened. Allow to cool slightly, and then remove the bag, squeezing out as much of its sticky, pectin-rich contents into the pan as you can. Add the sugar and heat again very gently, stirring to allow the sugar to completely dissolve. Then, bring to a rapid boil and allow to boil for 20 minutes, when you can start to test to see if it has reached setting point. To test for a set, spoon a small drop of marmalade onto a cool plate, and tip the plate or poke the drop with your finger after a few seconds to see if a slight skin is forming on the surface of the marmalade. Test at five-minute intervals until the set is reached. When it is done, remove from the heat and allow to cool for 15 minutes. Stir gently, and skim off any scum that remains on the surface, then pour through a wide funnel or spoon into sterilised jars, trying to make sure the peel is evenly distributed amongst them. Seal, cool, label and enjoy!